1. Utomo DA. Upaya pencegahan penggunaan doping pada atlet cabang olahraga atletik di daerah istimewa Yogyakarta [Skripsi]. Yogyakarta: Fakultas Ilmu Keolahragaan Universitas Negeri Yogyakarta; 2014. 2. Madlizzari, D. Hubungan antara tingkat pengetahuan tentang jenis doping dan bahayanya dengan perilaku pemakaian doping pada atlet UKM pencak silat UPI Bandung [Skripsi]. Bandung: Universitas Pendidikan Indonesia; 2014. 3. WADA. Anti-doping testing figures report. http://www.wada-ama.org. 2015. 4. Zhang Y, Woods RM, Breitbach ZS, Daniel WA. 1,3-dimethylamylamine (DMAA) in supplements and geranium products: Natural or synthetic?. Drug Test and Analysis. 2012 Dec;4(12):986-90. doi: 10.1002/dta.1368. 5. WADA. The 2010 Prohibited list international standard, the world anti- doping agency code. http://www.wada-ama.org. 2010. 6. WADA. The 2016 Prohibited list international standard, the world anti-doping agency code. http://www.wada-ama.org. 2016. 7. Li JS, Chen M, Li ZC. Identification and quantification of dimethylamylamine in geranium by liquid chromatography tandem mass spectrometry. Analytical Chemistry Insights. 2012;7:47-58. doi: 10.4137/ACI.S9969. 8. Sellergen J, Allender CJ. Molecularly imprinted polymers: A bridge to advanced drug delivery. Advanced Drug Delivery Reviews. 2005 Dec 6;57(12):1733-41. 9. Vasapollo G, Sole RD, Mergola L, Lazzoi MR, Scardino A, Scorrano S, et.al. Molecularly imprinted polymers: Present and future prospective. International Journal of Molecular Science. 2011;12(9):5908–5945. doi: 10.3390/ijms12095908. 10. Lorenzo CA, Concheiro A. Handbook of molecularly imprinted polymers. United Kingdom: Smithers Rapra Technology. 2013. 11. Spivak DA. Optimization, evaluation, and characterization of molecularly imprinted polymers. Advanced Drug Delivery Reviews. 2005 Dec 6;57(12):1779-94. DOI: 10.1016/j.addr.2005.07.012. 12. Kartasasmita RE, Hasanah AN, Ibrahim S. Synthesis of selective molecularly imprinted polymer for solid-phase extraction of glipizide by using a pseudo-template. 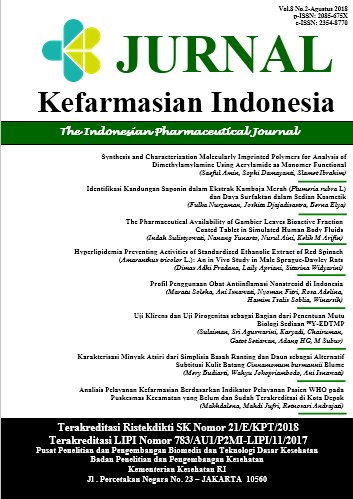 Journal of Chemical & Pharmaceutical Research. 2013;5(10):351-355. 13. Nguyen TH, Ansell RJ. N-isopropylacrylamide as a functional monomer for noncovalent molecular imprinting. Journal of Molecular Recognition. 2011; 25(1):1–10. doi: 10.1002/jmr.1163. 14. Stuti JSPR, Nigam I. Synthesis and characterization of crosslinkable copolymers of MMA with diacrylate/ dimethacrylate. Malaysian Polymer Journal. 2012;7(1): 34-41. 15. Windyasari I. Poli (Metil Metakrilat co Etilen Glikol Dimetakrilat) sebagai Kafein-Molecularly Imprinted Polymers (MIPs): Sintesis dan Karakterisasi [Tesis]. Bandung: Program Studi Magister Kimia Institut Teknologi Bandung; 2014. 16. Gandjar IG, Rohman A. Analisis obat secara spektroskopi dan kromatografi. Yogyakarta: Pustaka Pelajar; 2012. 17. Day RA, Underwood AL. Analisis kimia kuantitatif, edisi keenam. Jakarta: Erlangga; 2002. 19. Gunawan B, Azhari CD. Karakterisasi spektrofotometri IR dan scanning electron microscopy (SEM) sensor gas dari bahan polimer poly ethelyn glycol (PEG). Jurnal Sains dan Teknologi. 2010;3(2):1-17. 20. Gonzalez GP, Hernando PF, Alegria JSD. A morphological study of molecularly imprinted polymers using the scanning electron microscope. Analytica Chimica Acta. 2005; 557 (1-2):179-83.